Over a year after her parents sent her away from Hawaii to live with her grandmother in landlocked Nebraska, Makani Young is still adjusting to her new life. She's made a small group of close friends and even flirted with romance, but her past in Hawaii is still hard to forget. And then . . . one by one the students of her new high school begin to die in a series of gruesome murders. Makani doesn't know who's next on the list. Between this, and a secret scorching relationship with the school weirdo, this school year may turn out to be one to die for . . . literally. 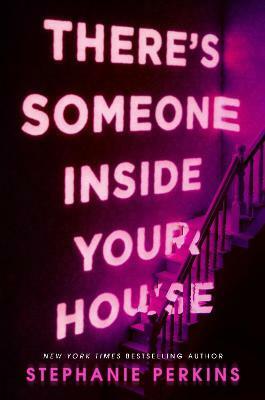 There's Someone Inside Your House by Stephanie Perkins will have you swooning with fear and romance, and is the perfect page-turner for fans of Scream Queens and I Know What You Did Last Summer. Stephanie Perkins is The New York Times and international bestselling author of Anna and the French Kiss, Lola and the Boy Next Door and Isla and the Happily Ever After. She also edited two short-story collections: the winter collection My True Love Gave to Me and the summer collection Summer Days & Summer Nights. She was born in South Carolina, raised in Arizona, and attended universities in California and Georgia. Since 2004 she has lived in the mountains of North Carolina.